A guide to Amish furniture in Minnesota The North Star State is home to 3,000+ Amish in over a dozen communities. Residents of Minneapolis and St. Paul along with other MN cities like Rochester, Bloomington and Duluth don’t have far to look for Amish furniture, with a number of Amish furniture makers and retail Amish furniture dealers across the state. Amish are well known for their high quality tables, chairs, cabinets, and other home furnishings. Amish wood workers produce furniture in a wide range of styles, including Mission, Craftsman, Queen Anne, Shaker and contemporary designs. Minnesota’s largest Amish settlement is found near the town of Harmony in Fillmore County, and is home to several Amish furniture craftsmen. Handcrafted furniture for every room of the home. Customized work available. 27358 Bay Shore Dr. NW. Minnesota Amish furniture by Amish craftsman Elias and six Minnesota Amish cabinet makers. Located in the Twin Cities area. Amish-made benches, barstools, hutches, tables, chairs in Mission and other styles. Amish dining room sets, outdoor furniture, grandfather clocks, chests, nightstands, coffee tables, beds, baby furniture, more. Amish furniture for the living room, bedroom, office kitchen, children’s room, in six varieties of wood. Outdoor Amish furniture (rockers, chairs, lighthouses, windmills, mailboxes), Amish children’s toys and furniture including rockers, puzzles, cribs, more. Other Amish furniture items include beds, tables, gun cabinets, wash basins, curio cabinets, butcher blocks, cedar chests, and more. Pieces produced by Ohio Amish. Amish-born brothers Reuben and Jake Hershberger retail Amish made furniture including TV stands, baby furniture, outdoor furniture, bedroom sets, headboards, dressing tables, poly lawn furniture, more. 13,000 square foot showroom. Solid hard wood construction in hickory, maple, elm, oak, quarter sawn white oak, walnut, cherry, rustic cherry. Located in Harmony in the heart of Minnesota’s largest Amish settlement. Wide range of Amish made furniture available for order online–tables, desks, TV centers, bedrooms and more. Retailing Amish-built furniture from Indiana and Ohio suppliers in the Minneapolis/St. Paul area. Solid hardwood construction: grey elm, oak, hickory, cherry, maple. LCD stands and cabinets, china cabinets, dressers, beds, office furniture, more. Custom orders with custom finishing, hardware, wood. Amish made tables, chairs, hutches, bedroom sets, entertainment centers (TV stands, Plasma consoles). Amish office furniture including writing tables, desks, filing cabinets, conference tables, more. Styles including Shaker, Mission, and others. Home accessories including wall hangings, clocks, baskets, dolls, primitives, quilts. Chests, tables, beds and more by Midwestern Amish. Seeking Amish furniture beyond Minnesota? The Amish Furniture Guide main directory features listings of Amish furniture dealers across the United States and Canada. Note to Minnesota residents: Please be sure to check opening hours of any Amish furniture businesses listed in this guide before traveling long distances. While we strive to keep this directory up-to-date, business locations and schedules can change. Not responsible for changes to information. The North Star State is home to a number of Amish communities, the largest of which is found near the town of Harmony in Fillmore County. Amish in Minnesota number over 3,000, with communities found across the state (Read more on Minnesota Amish settlements). While Amish have traditionally relied on farming, furniture craftsmanship has provided many Minnesota Amish families an alternative occupation. Amish furniture making has grown into a thriving industry, with a number of Amish shops and furniture retailers found across Minnesota. Amish woodworking is typically based in small shops located on Amish property near the home. Woodworking shops typically have anywhere from a handful of employees, to up to 30 or more, though less than 10 workers is most common. In some cases, only family members will assist in a furniture shop. Amish prefer the small-scale in most things they do, believing such an approach to be more manageable, and more likely to assure them of a favorable outcome–whether it comes to the prosperity of their Christian-based communities or the quality of their furniture craftsmanship. Amish furniture pieces come in a wide range of woods, designs, and finishes. Amish may seem slow to change, but when it comes to satisfying their customers, Amish will create any range of furniture pieces, even those which they wouldn’t use in their own homes, such as contemporary styles. Amish furniture craftsmen have proven to be creative and adaptable within the competitive furniture industry. Hardwoods used by Amish craftsmen include maple, birch, oak, hickory, quartersawn oak, cherry, and more. Common designs include the ever-popular Mission, Shaker, Colonial, and Craftsman styles. Some Amish furniture makers specialize in rustic hickory furniture, often used to create rockers and tables. 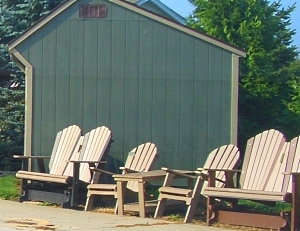 Other Amish focus on outdoor furniture products, like gazebos, sheds, and playsets. Some create animal hutches, chicken coops, and doghouses as well. The poly outdoor furniture segment has become popular with Amish manufacturers in recent years. In the home, the range of Amish furniture styles is broad. Living room pieces such as coffee tables, entertainment centers, sofas, and many others are found in the Amish repertoire. In the kitchen, we find Amish-crafted cabinets and accessories such as pantries and pie holders. Bedroom suites include bedframes, armoires, dressers, and a wide range of other pieces. Children’s furniture such as chairs, rocking horses, and other pieces are made by numerous Amish woodworkers. The office is not neglected either, with desks, bookcases, and computer centers common items produced in Amish workshops. Once furniture pieces are crafted, they leave Amish woodworking shops, usually headed for a local Amish finishing shop, where stain, sealer and final coat of finish are applied. Furniture finishing has been described by Amish as an “art”, and applying the proper amount of coat and avoiding runs are two important elements of this crucial final stage. Amish furniture stains come in a wide range to suit diverse customer needs. Minnesota’s Amish population dates to the 1970s, and since that time the Minnesota Amish furniture industry has developed as demand for Amish furniture has grown. Amish woodworkers in Harmony and other settlements provide a steady stream of furniture pieces for customers in Minnesota and beyond. Minnesota Amish furniture shoppers have a wide range of options, from buying furniture direct from a Minnesota Amish furniture shop, to ordering Amish furniture online, to purchasing their pieces through retail sellers of Amish furniture across Minnesota. Looking for an Amish furniture maker. I am in seek of a company called SSCTM. They are supposedly a small Amish Furniture company that makes Furniture for Fifth Avenue Furniture in Baxter MN. Could find no record of them online and this company supposedly makes this nice Log White Cedar Futon couch and love seat they have there. My wife and I are looking for a patio glider with gliding ottoman. Is this something you make, or could make, and how much. Hello, I am looking for an Amish or farm home wood cooking stove. Thank You. I’m looking for a honey oakstain, 2-step Queen Ann style bed stool for my high bed.